How can someone who lived over 1500 years ago affect the s piritual, physical and emotional lives of people today? The Benedictine Tradition has its origins in a relatively small text written in an obscure monastery south of Rome, somewhere between 530 – 550 A.D., yet the Rule of Benedict is generally acknowledged as one of the most influential documents of Western Civilization. 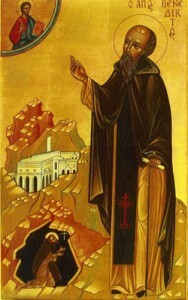 Its author, Benedict of Nursia (c. 480-550) is a gentle genius of the monastic way of life. 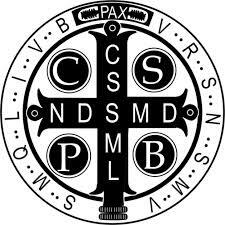 Saint Benedict is known as the Father of Western Monasticism and his Holy Rule continues to be a foundational basis for religious orders, in addition to their own charisms. Interestingly, the Rule of Benedict is being used more and more often in corporate settings to help employers and employees work together as teams. Its core values of stability, humility, hospitality and community helps to create a sense of worth and value in work environments. Lectio Divina— Latin for Divine Reading, is a Benedictine prayer form based on praying with the Word of God. Traditionally, Lectio Divina has four separate movements: Lectio (read); Meditatio (meditate); Oratio (pray); Contemplatio (contemplate). First a passage of Scripture is read, then its meaning is reflected upon. This is followed by prayer and contemplation on the Word of God. One of the areas the Benedictine Spirituality group explores and learns is the art of lectio divina. Lectio differs substantially from the ordinary act of reading, even spiritual reading. Lectio is at the service of prayer and goes beyond the act merely absorbing the contents of the page. The text serves as mirror that brings the inner realities to consciousness. This heightened awareness exposes our need for Divine help and readily leads to prayer. Learn more about the art of Lectio Divna. St. Benedict starts with simple advice for anyone who wants to follow God more closely— to listen and respond to God’s voice in our lives. “Listen” is the first work in the Rule of St. Benedict. Come listen and pray. Anyone interested in developing a deeper spirituality of simplicity and humility is welcome. Benedictine Spirituality provides a deep sense of peace and serenity. When we pray together, we are reminded of our common faith in God, our common reliance on God’s redeeming grace inout lives. The Benedictine Spirituality group has been praying the Liturgy of the Hours Evening Prayer every Monday at 6:45 P.M. in the Chapel at the Parish Center immediately after Eucharistic Adoration since 1999. The prayer service is approximately 20 – 30 minutes long. The group meets 7:00 P.M. on the 3rd Monday of the month, after Evening Prayer in the Parish Center. I want to deepen my prayer life!